There is no place like home: Show and Tell Friday! Welcome to “Show and Tell Friday!” Do you have something special to share with us? It could be a trinket from grade school, a piece of jewelry, or a treasured collection. Look around your home for something to share; dig through those boxes in your closet if you have to! Share photos and the story that goes with your special item. Hello! I am back from a wonderful vacation visiting my family in Rhode Island, and I have two new treasures to share. My mom gave me this small dish set with sweet violets. Someone mentioned that it may be a sugar and creamer set. But I'm going to use it as a miniature pitcher and bowl in my bathroom. 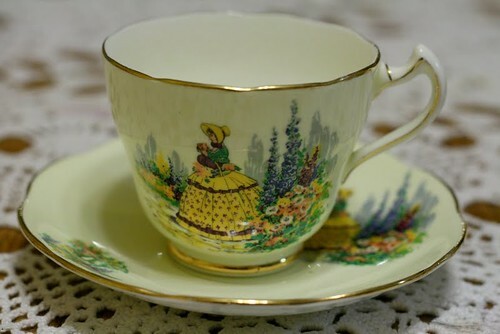 We visited quite a few antique shops in Rhode Island and I had to bring home this teacup because it reminded me of Sunbonnet Sue. 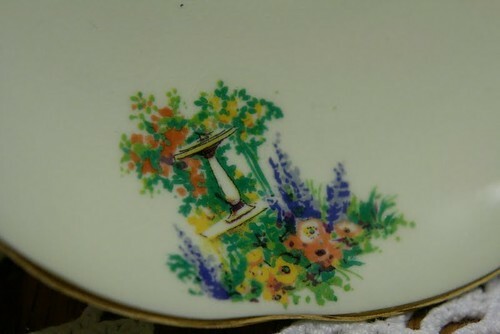 Even the saucer has wonderful details. Thank you for looking at my show and tell! I will be back soon with lots of vacation pictures. Have a wonderful weekend! Remember, that your Show and Tell needs to be something from your home or garden. Please read the Show and Tell Guidelines for step-by-step instructions on how to participate. If you would like to join in, please leave your exact show and tell blog post link, along with your first name only (this makes the list easier to read). If your link has been removed from Mr. Linky, please re-read over the guidelines before re-posting, or e-mail me with any questions. My favorite is the little sugar/creamer or miniature pitcher/bowl combination. I love how one sits inside the other so perfectly. I've enjoyed linking up to this for the last three times. Thank you for hosting. Hi Dixie, You must had a great time during your vacation. I love the miniature pitcher, its cute. Glad to hear you had a wonderful time/holiday. Both sets are so precious and such wonderful new treasures to have. It's good to be back participating in S&TF again. 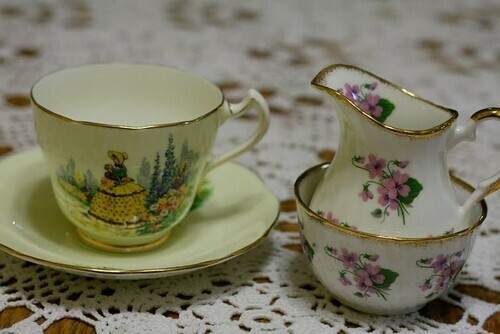 My favorite this week is the tea cup and saucer. 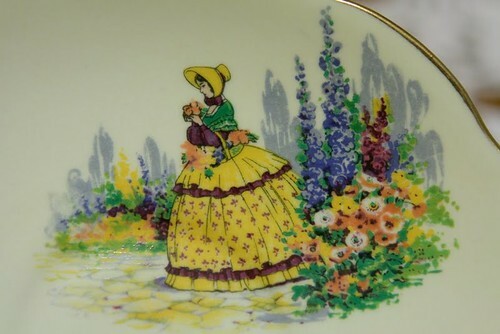 It is a perfect addition to two of your collections....the tea cup one and the Sunbonnet Sue collection. Looking forward to seeing your vacation pictures. Both sets are lovely! I can't decide which I like best. Wow, you were in Rhode Island! My youngest sister and family live right close to the RI border with MA. Your new treasures are wonderful...such pretty designs. Welcome home! Those are lovely, and I love using the one set as a little bowl and pitcher. Love the miniature pitcher very much. Its beautiful and cute at the same time. Thanks for sharing. Hi Kelli, I love the creamer and sugar collection the best! !I am sharing a photo of my grandson and the story behind it..I hope it will not get bumped off..
Hi Kelli, welcome home from your vacation! I love your sweet items you brought home! 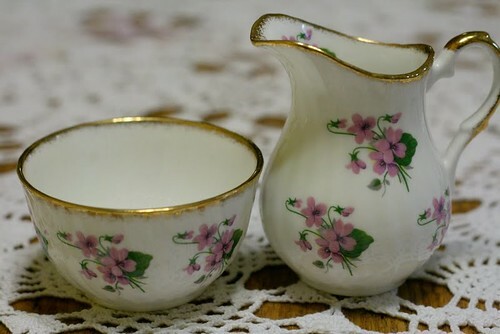 I love the violets on that little sugar and creamer set! I do so love both pieces Kelli!!!! Violets, for one, is a favorite of mine. And the tea cup/saucer is fantastic!!! What a charming set. Love it. 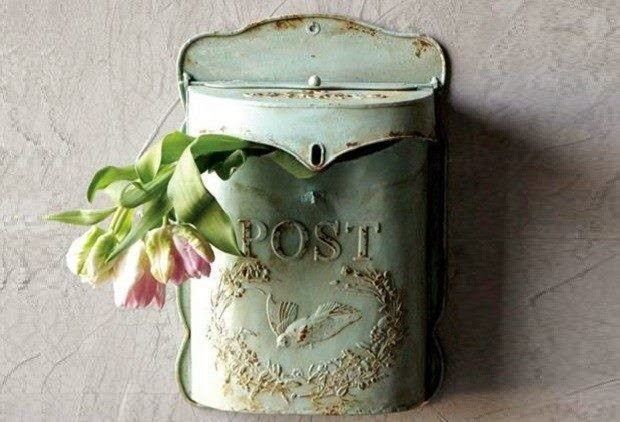 My show n tell is posted...it's ONE GREAT HOUSEHOLD tip today. Something I did this past week, that I want to 'shout to the world' how great a tip it is!!! Come by and see/read the step by step. Love the sugar/creamer! So pretty. The lady on the other is so dainty looking. Very nice post. Thanks you. Sounds like you had a wonderful time and even broguht back some lovely treasures. Can't wait to the pic's from vaca. Welcome home, Kelli. I know it must be hard living so far from your Mom so I'm sure you had a wonderful visit with her. When I first saw the bowl and pitcher, it reminded me of those embroidered pillow cases. You know the ones? I think it is just lovely and the bathroom is an ideal place for it. I would have loved browsing through those antique stores with you. Your new treasures are wonderful. The little bowl and pitcher are so sweet and they will be a great addition to your bathroom - what a great idea! I l-o-v-e the cup and saucer. I'd love to find something like it because it's different than the usual floral sets. So glad you had a chance to get away and that you had a safe trip home again. Thanks for sharing your pretties today. Kelli, these are SO pretty!!! Especially the Sunbonnet Sue!!! I hope y'all had a very relaxing vacation! Cute idea to use the cup and pitcher as a bowl and pitcher. will try to get together a post for next week and join in. Beautiful Kelli! What fun finds. I cannot wait to see your vacation photos. We are still editing ours to share also. Love your treasures, Kellie! I really like violets and the cup & saucer is too cute. How cute, I love the pitcher. I am glad to see you back. I hope you had a wonderful vacation!!! P.S. I've posted today on my fave homeschool resources and am looking for more good ones~I'd love to get your feedback on it if you have time to drop by. Thanks! The things you bought are simply gorgeous !!!! 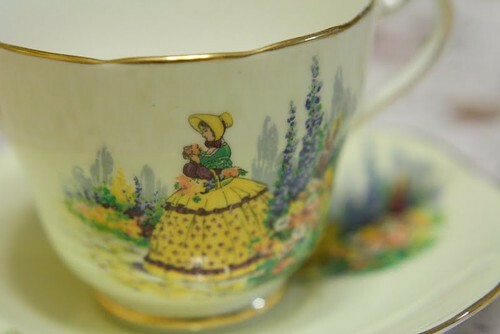 I love the lady on the cup and saucer, so beautiful !! very pretty. love the little tea cup. What cute little treasures! Just precious! Oh, they are both so pretty! I'm happy to hear you had a nice vacation. Looking forward to hearing more about it and seeing pictures! Very cute. Your camera takes good detail pictures of small items. Hope you are enjoying yourself. I really enjoyed seeing those! The colors are so vivid! Glad you had a nice vacation. My fav. is definately the girl with sunbonnet! Oh, I just adore that precious little cup and saucer. I'm glad to hear you had a nice time visiting your family. 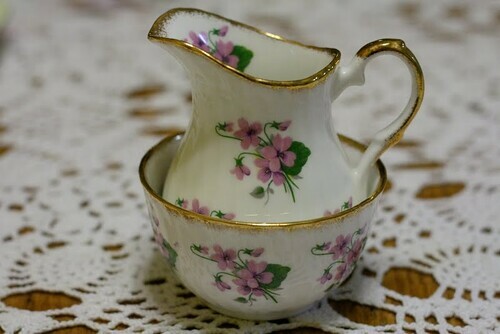 That is a darling little creamer and sugar and it would look sweet in my bathroom too!! Check the bottom of the cup & saucer to see who made it...it's lovely and you may be surprised to look it up on ebay..
Glad that you had a wonderful vacation. I love, love, love, your tea cup and saucer. So very beautiful. The bowl and pitcher from your mom is so pretty. I like the bathroom idea. Love your "Sunbonnet Sue" find. It really is pretty and has lots of details. Hope you had a great vacation! Those are really nice sugar/creamer. Hope your vacation was a relaxing one. Have a great week.